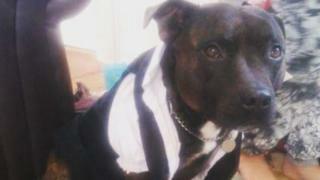 Teddy was killed by a teenager who "completely lost his temper"
In sentencing, the judge, Justice Diana Baker said the dog, Teddy, suffered a fractured skull and multiple blunt force trauma injuries to his head, neck and torso resulting in internal bleeding.Addressing the boy, she said domestic violence has "severely affected" his emotional wellbeing. "You are a young man who has lived with domestic violence for a long time," the judge said. "Domestic violence under the influence of alcohol that has severely affected your emotional wellbeing and ability to deal with stressful situations. "A victim impact statement from Teddy's owner was read to the court. In it, Jacqueline Stevens, 71, explained how she had hand-reared the Staffordshire bull terrier and kept him for nine years. "My life has been ripped apart and has been changed forever," she said.She added that she now "dreads going to St Ives" due to the "sad associations and memories".The incident happened when the dog held down a pet terrier belonging to the family of the convicted boy who had a "total loss of control", the court heard.The boy was sentenced to an 18-month rehabilitation order with 18 months of supervision. He was also given an eight-week curfew.The ?500 fine will be paid by his mother at a rate of ?50 a week.The boy will not be allowed to apply for the ban on him keeping animals to be lifted for the next three years.However, the court heard the family would be able to keep their pet terrier.